I am Karen Sausman, the owner of Kingsmark. I have been involved with the careful breeding of animals both as a profession and an avocation for over 40 years. As a conservation biologist, I am involved with international breeding programs for many endangered species of antelopes and cats. I manage breeding programs and studbooks for several species. I am also the retired director of one of 200 accredited zoological parks in the US. I have been breeding horses, dogs and, now cats since the 1960s. I decided to create a domestic breed of cat that was partially modeled on the beautiful African Serval. 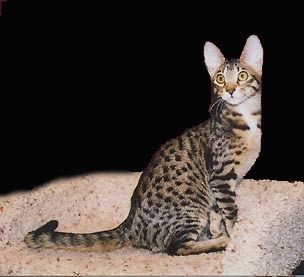 However, unlike the breed known as Savannah cats, Serengeti cats have NO serval blood. I bring the same care to the breeding of quality Serengetis that I use with some of the most endangered animals on earth. Indeed, it is my love of all wildlife coupled with the firm conviction that wild animals should not be kept as pets because of the incredible commitment it takes to care for them properly, that lead me to help develop the Serengeti Cats as an exciting and much more fulfilling substitute for owning a wild cat. 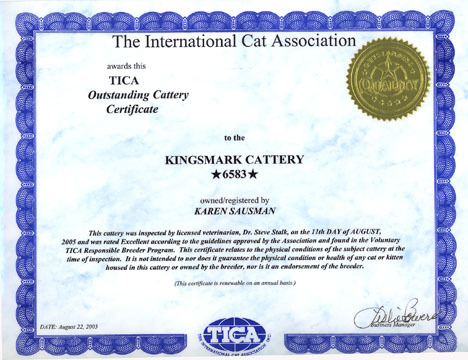 Kingsmark is a TICA & CFA registered cattery. Because of work schedules I do not show my cats as often as I would like, but I do stay involved in all aspects of the cat fancy. I provide written health contracts with any cat or kitten that leaves my cattery. Enjoy the rest of my website. Inquiries about my breeding program, as well as Serengeti Cats in general, are welcome. All materials on this site Copyright © by KINGSMARK 1997-2017. All right reserved.